WCGC Champions ‘Team Thailand’, comprising Paul Judge and Pim Surintarangoul from Phuket’s Prime Real Estate, celebrate their 2018 World Final win. Events will be hosted by several prestigious courses throughout Thailand. The golfing challenge continues in 2019 with a qualifier at the Laguna Golf Club in Phuket on April 26 where teams will be battling for the remaining six places at the world final. Winners will receive an all expenses trip to the World Final at Oitavoss Dunes in Cascais, Portugal, provided by prominent sponsors such as Thai Airways. 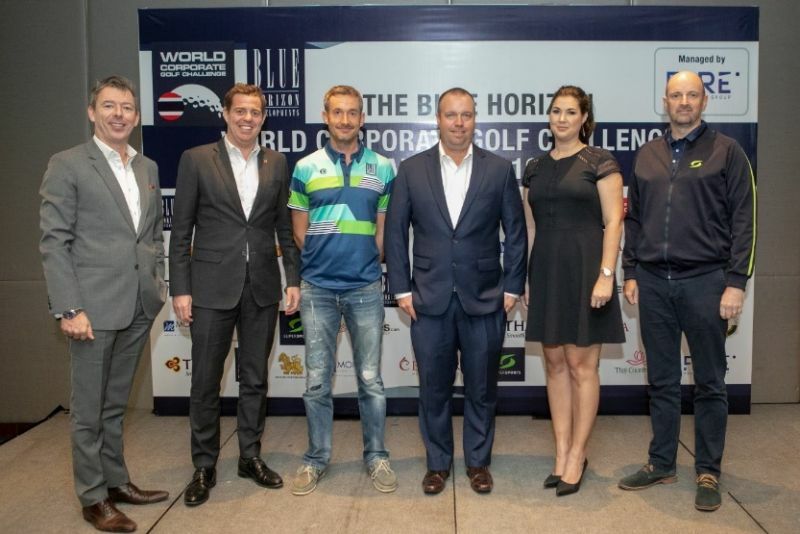 This year sees the continuation of sponsorship from Blue Horizon Developments, with CEO Andres Pira commenting ‘We at Blue Horizon are delighted once again to be part of the World Corporate Golf Challenge Thailand. Last year was a great success and with Thailand winning the world final made it that much better. We are very much looking forward to working with Fore Management Group again delivering Thailand’s biggest and most prestigious amateur golf event in the country for 2019’. 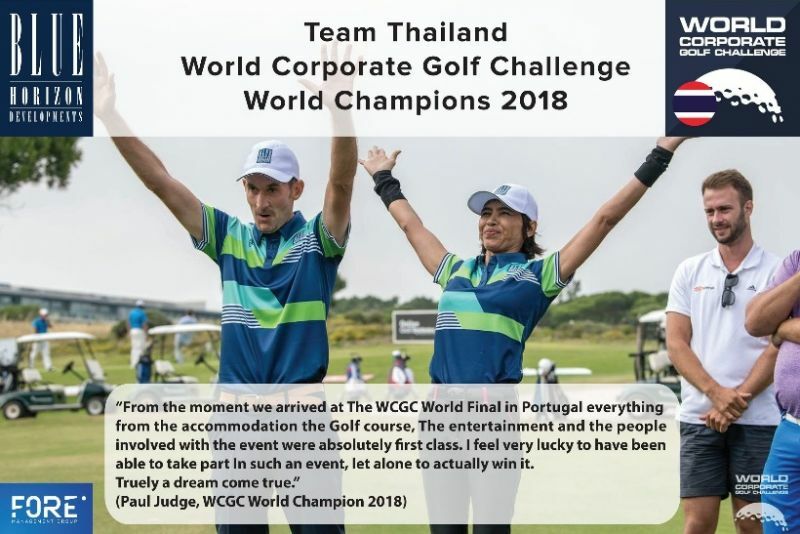 Chris Watson (Managing Director of Fore Management Group) commented, ‘We are so excited to get started on the 2019 event, with last year’s victory at the world final in Portugal, this year’s event for Thailand promises to be bigger and better than ever before’. He continued ‘We are especially grateful to Andres and Blue Horizon Developments for their continued support’. The Blue Horizon World Corporate Golf Challenge has the inclusion of several prominent sponsors, providing high value from the entry-fees at each qualifier. This year reinstates Thai Airways as the Exclusive International Airline for the third year in a row. This year also sees several high-profile sponsors with the likes of SuperSports (Silver Sponsor), Monroe Consulting and the Singha Corporation (Bronze Sponsors) and Centara Resorts and Hotels as the exclusive hotel partner. Other event partners for this golfing challenge include FenixXcell, The Phuket News, Birdie, Golf Citizen, Bangkok Golf Centre, 4 Moles, Live 89.5 and Thai Visa. The World Corporate Golf Challenge is the biggest corporate golf tournament in the world and since its inception 25 years ago, over one million golfers have competed across the globe for the chance to represent their company and country at the World Finals. Recent years have been a period of significant development for the WCGC, building on the success of the previous years and World Finals in Scotland, Sotogrande, Spain, and Cascais, Portugal. The World Final continues to be broadcast by Golfing World TV to over 50 broadcasters with an estimated home reach of 350 million globally. The World Final continues to also be covered by Time and Fortune magazines. The World Corporate Golf Challenge first came to Thailand in 2017, after Fore Management Group purchased the license. The event doubled in size from 2017 to 2018 and Fore Management Group expect the event to double in size this year with over 300 teams taking part. Team Thailand have made a huge impact on the WCGC World Finals finishing 3rd in 2017 and winning the world final in 2018. As the process begins to find the Thailand winners of 2019, the team hope to retain their world crown.